Metal case sphere finished in polished rose gold plating. Sporting a beautiful, dainty-looking body, this Howard Miller Windsor Carriage Table Clock will render an elegant look to your wall. 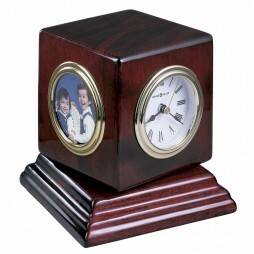 A handsome, carriage-style table clock with beveled sides. White dial features black Roman numerals, glass crystal, and a polished brass finished waterfall bezel. Felt bottom protects your desktop. Finished in Windsor Cherry on select hardwoods and veneers. Quartz movement includes battery. Perfect for gift-giving or an addition to your home! 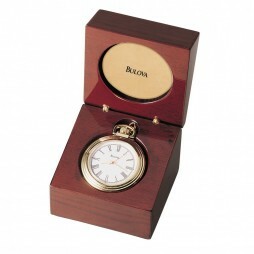 The Ashton Pocket Watch Table Clock fills 2 roles as a pocket watch with engravable back and 12″ chain or a table clock in its’ solid wood hinged case. 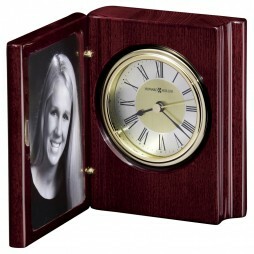 The case features a high gloss piano finish over mahogany stain. 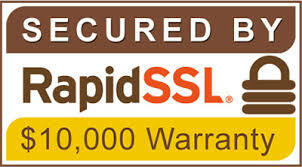 A 2.5′ round engraving plate is included. 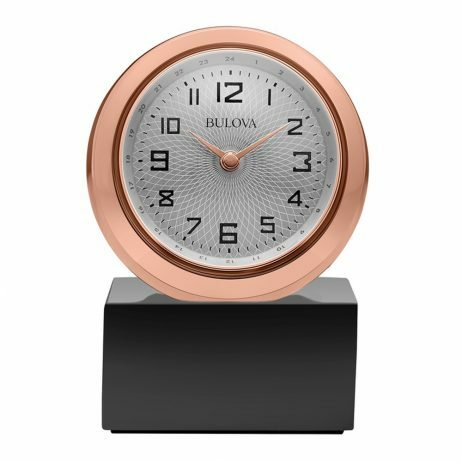 Exquisitely designed and reminiscent of the Victorian era of discovery, this eclectic, ornate clock stands out among all others in terms of its design and style. 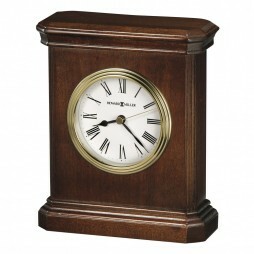 Featuring clear casing supported on a gleaming mahogany base, its elegance is further accentuated by its dark hands and Roman numerals which stand out against the golden finish of its internal structure. 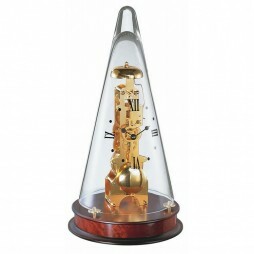 This decorative household item also marks time by striking its bell once every hour and has a 14 day power reserve. Take a break from those stereo type designs of wall mounted clocks by decorating your home with this Howard Miller Weatherton Table Clock with Hygrometer and Thermometer. 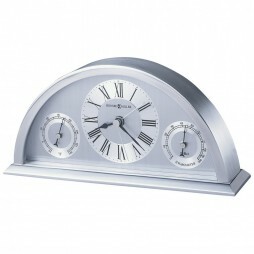 Finished in brushed and polished silver-tone, this semicircular metal clock combines contemporary flair with the additional function of a hygrometer and thermometer. The dials feature circular, diamond-cut numeral rings, black Roman numerals, black hour and minute hands, and silver second and alarm hands. The stylish finish of the clock makes it look trendy and ready to use for your living space?s modish interior.